the style saloniste: Truly Glam! Eighty unique designs by vintage Yves Saint Laurent, Patou, Ralph Rucci, Vivienne Westwood, James Galanos, Balenciaga, Balmain, Yamamoto, Alaia, Lanvin, and other luminaries, go on show in Russia this week, in a dazzling first-time exhibit. San Francisco’s Tatiana Sorokko, a former top model in Paris, Milan, and London, has been collecting rare and gorgeous vintage and one-of-a-kind Paris couture since her early days modeling in Europe in the nineties. At that time, no-one was interested in vintage and couture, she said, so she was able to find handsewn, beaded and elaborately constructed pieces by Balenciaga, Gaultier, Patou and Balmain for a song. Today, she collects Ralph Rucci couture, and commissions gowns from Alaia. Now her collection is being shown in Moscow as part of Russian Fashion Week, April 1-31, 2010. 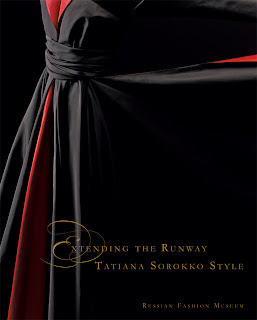 From her early days modeling in Paris for top designers, Tatiana Sorokko has been besotted with fashion. Imagine modeling for Yves Saint Laurent in his glory days, and becoming best friends and treasured muse for Ralph Rucci. She modeled for Vivienne Westwood (with Jerry Hall) or Yohji Yamamoto or GianFranco Ferre and Azzedine Alaia—and then scooped up some of the best sample gowns to add to your collection. 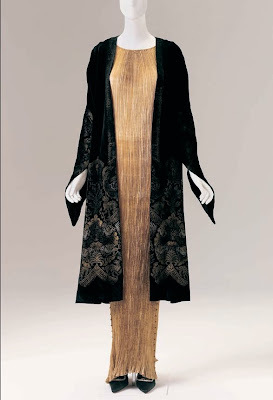 Or even better, commissioned a one-of-a-kind evening gown from Alaia or Ferre. I’ve been very fortunate to see up-close many of Tatiana Sorokko’s couture outfits as she wears them to opening night galas of the San Francisco Opera or the San Francisco Symphony, and to gallery openings and parties in California and in Paris and New York. I’ve also seen them in her closets at her house in Mill Valley, north of San Francisco, where she lives with her husband, gallery owner Serge Sorokko. Tatiana carefully stores her collection of precious gowns, along with her collection of Codognato jewelry, Blahnik shoes, Hermes bags and gloves, and wildly original hats. 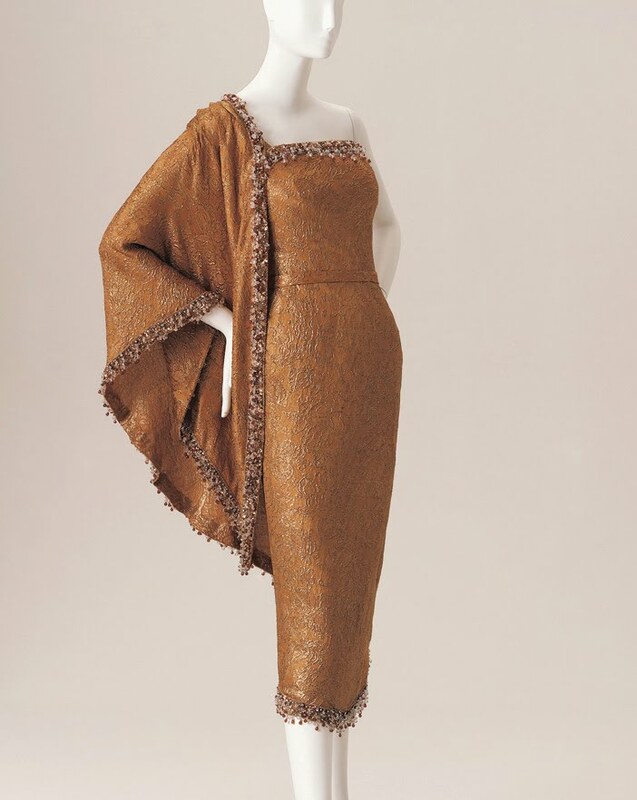 There are beaded tunics (James Galanos), and silk-screened evening jackets (Ralph Rucci), as well as a Patou coat, and a Ralph Rucci gown with an orange coq feather bolero. ‘Splendeur!’ as Diane Vreeland would exclaim in her inimitable faux French accent. 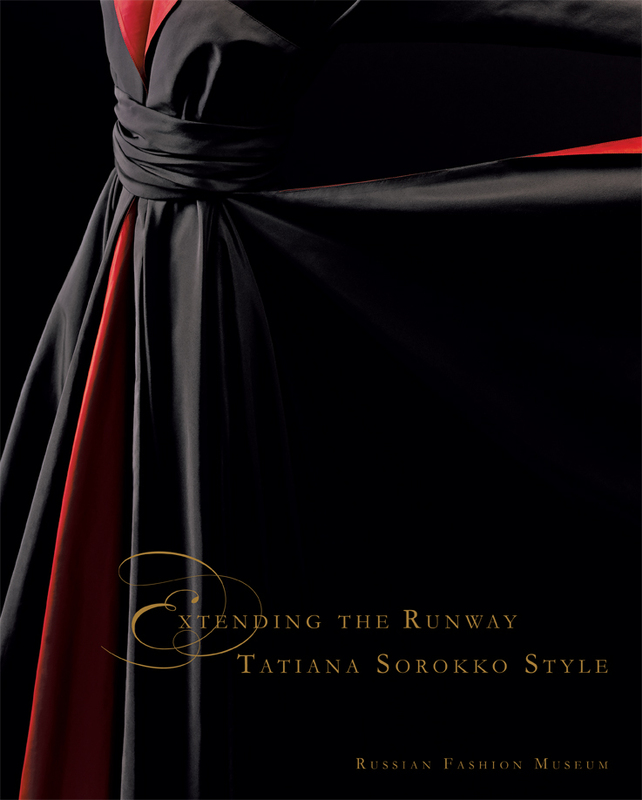 “Extending the Runway: Tatiana Sorokko Style” opens in Moscow on April 2, 2010 and features a collection of over 80 garments and accessories from Tatiana Sorokko’s extraordinary couture wardrobe. The exhibition runs through May 1, 2010,at the brand new Russian Fashion Museum and has been curated by Dennita Sewell, former collections manager at the Metropolitan Museum of Art and currently curator of fashion design at the Phoenix Art Museum. The exhibition coincides with Russian Fashion Week, which launches its 20th season on April 1, 2010 at the World Trade Center in Moscow. Tatiana Sorokko was the first Soviet/Russian model to achieve worldwide success. 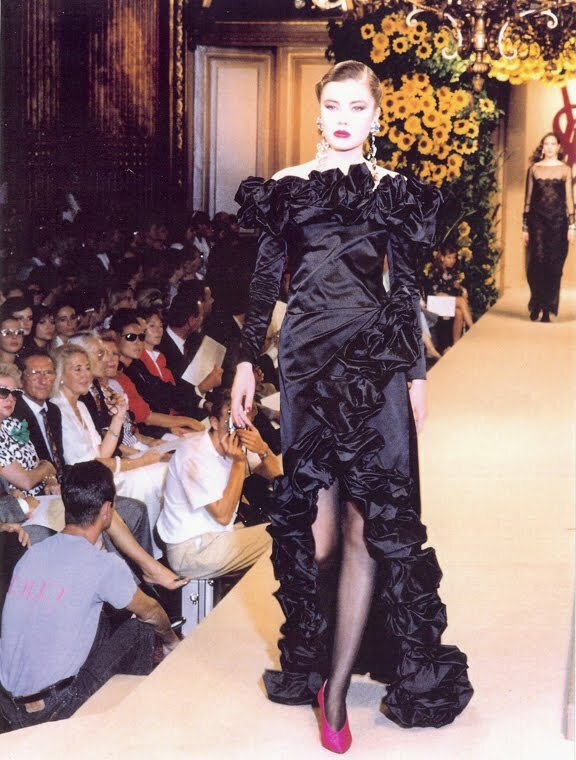 Moving from Moscow to Paris in 1990, she walked the runways for major designers such as Yves Saint Laurent, Hubert de Givenchy, Karl Lagerfeld, Miuccia Prada, Issey Miyake, Alexander McQueen, Marc Jacobs, and Calvin Klein, among many others. For over a decade, Sorokko graced the covers and editorial pages of European and American magazines such as Harper’s Bazaar, Vogue, Elle and Cosmopolitan. 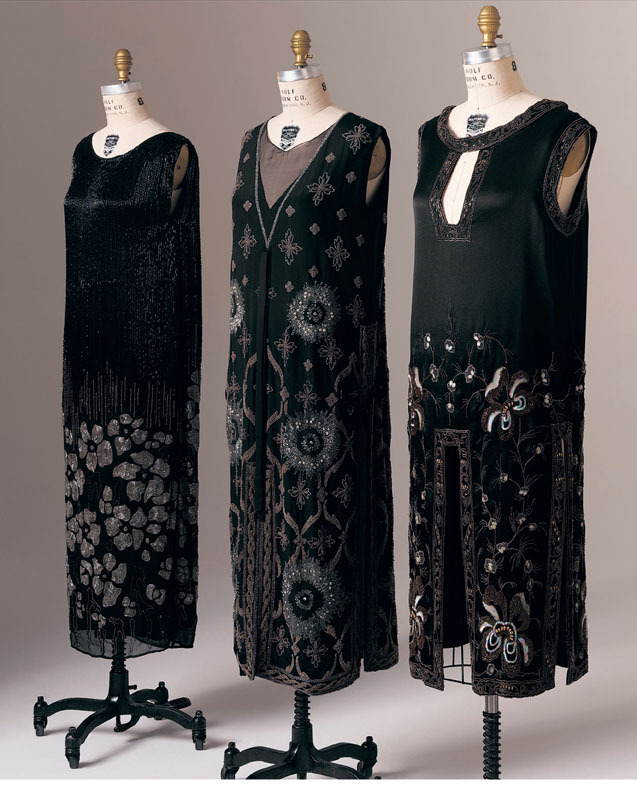 ‘Extending the Runway: Tatiana Sorokko Style’ showcases works from the early 20s through today, by legendary designers and fashion houses such as Fortuny, Paquin, Lanvin, Madame Grès, Balmain, Patou, Balenciaga, Ungaro, Hermès, Alaia, Jean Paul Gaultier, Gianfranco Ferré, Vivienne Westwood, Comme des Garçons, Yamamoto, Halston, Galanos, and Chado Ralph Rucci, among others. ‘Extending the Runway: Tatiana Sorokko Style’ will occupy the newly renovated former offices of the Soviet Prime Minister Mikhail Solomentsev. This historical building is part of the All-Russian Museum of Decorative Arts. It is the first Western exhibition to take place here and a symbolic one as Tatiana left the Soviet Union, and now, twenty years later, she comes back to a new Russia to share her vision and exhibit her collection in the inner sanctum of the fallen empire. The Russian Fashion Museum (RFM) was established in Moscow in October 2009. It is part of the All-Russian Museum of Decorative and Applied Arts. 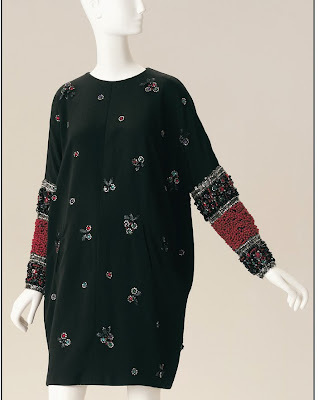 The RFM’s basic collection has over 30,000 unique pieces including medieval costumes, important textiles and fashion sketches, among other iconic objects. Russian Fashion Week in Moscow (RFW) is the biggest fashion event in Eastern Europe. On April 1-7, 2010 RFW is celebrating its 20th season in Moscow’s Congress Hall of the World Trade Center. The exhibition will run from April 2 until May 10, 2010. All-Russian Museum of Decorative Arts and Russian Fashion Museum: 3, Delegatskaya Street, Moscow. 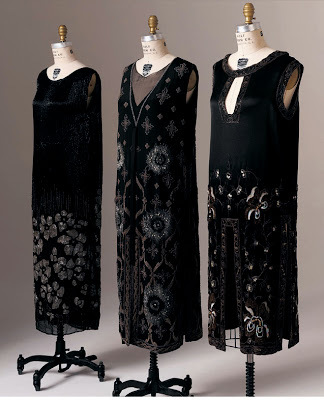 Tatiana in a twenties French beaded tunic, at the residence of vintage fashion expert and dealer Ricky Serbin and architect Mitchell Benjamin. Best friends, designer and muse; Ralph Rucci with one of his paintings, and Tatiana in a Ralph Rucci tunic inspired by the painting. To celebrate her show in Moscow, I sat down with Tatiana at her art-filled Mill Valley house, 30 minutes north of the Golden Gate Bridge, for a sip of Russian tea before she jetted off to Russia. Diane Dorrans Saeks: Your museum show in Moscow during Russian Fashion Week will be glamorous and divine. Wish I could be there! 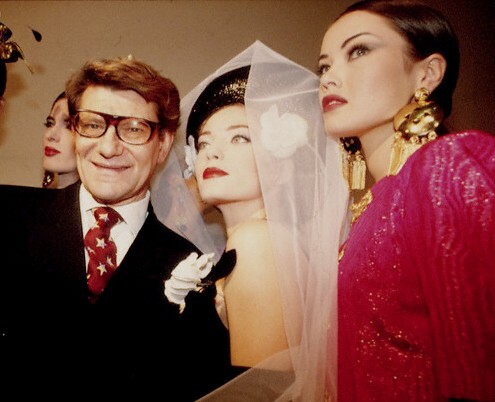 What’s it like returning to Moscow as such a celebrated fashion figure? Ralph Rucci will be there. Who could ask for more! Tatiana Sorokko: I left Moscow when I barely turned 18, at the time when most people were just finding out about perestroika and Russia was opening up. I was following in my father's steps and studied to be a physicist. My true love, however, was fashion, and all things glamorous fascinated me since I was a little girl. It was at that time that I met Marilyn Gauthier of Marilyn Models and she invited me to come to Paris to become a model. Naturally, I did not have to think long. The Moscow I left behind in 1990 was still the capital of the Soviet Union. There was not much there in terms of fashion. Department stores offered largely the same boring clothes, poorly executed and wholly unfashionable. It's an altogether different place now, some twenty years later. Moscow today is one of the most vibrant cities in Europe, a truly "happening" place. It is also remarkably fashionable. My exhibition is scheduled to coincide with the 10th anniversary of Russian Fashion Week. Numerous designers, both from Russia and elsewhere, will be showing their collections, and the public interest in enormous. Moscow has become a fashion capital, and I am very excited to be invited to bring my collection there. Having an inaugural exhibition at the brand new Russian Fashion Museum is a humbling experience. At the same time, I am thrilled that my show will be the first ever exhibition of Western couture, and I am happy to share my vision of fashion and style with Russian women. DDS: Which qualities do you look for in couture fashions you collect? TS: I look for intelligence behind the design, uniqueness and superb craftsmanship. I'd like to think that couture fashions I collect all have a style that is truly timeless. There are fewer and fewer artisans working for couturiers today. Fewer ateliers making feathers and embroidery, fewer hat and glove makers. It makes me sad to imagine that some day, like endangered species, they will disappear from the face of the earth, leaving couture an art form of the past. DDS: I've been fortunate to see you wearing many of these outfits. I love the craftsmanship, the detail, the luxe fabrics, the feathers and beading. I was able to view up-close the beaded Galanos tunic at a gallery party. 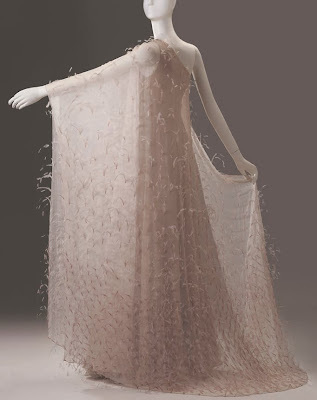 I watched the feathers fly when you wore the gloriously romantic Chado Ralph Rucci ivory feathered gown at the San Francisco Opera gala opening. Eight years ago there was the stunning and glorious Alaia couture gown, also at the opera opening. 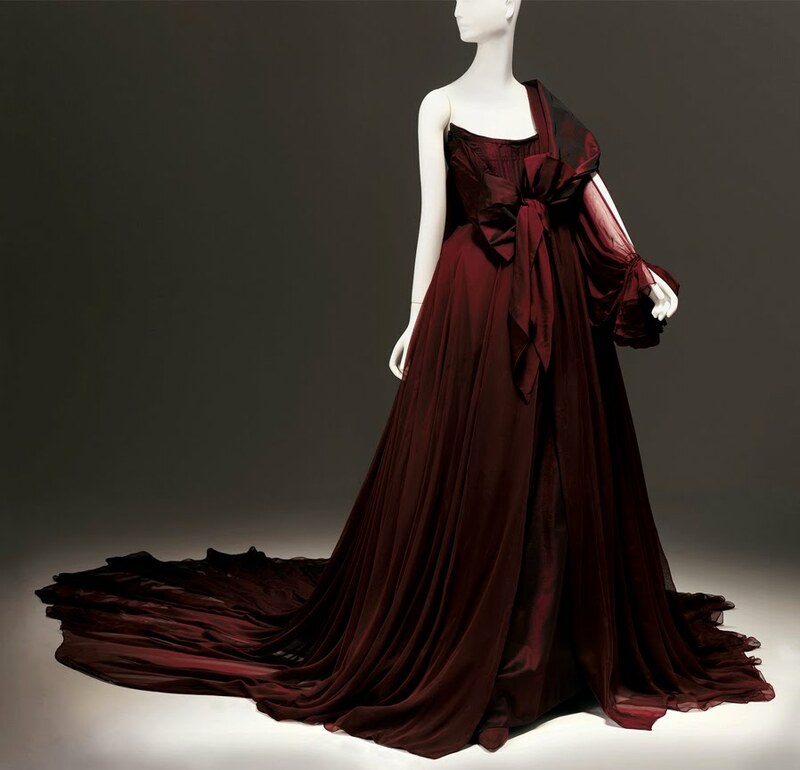 There were dozens of yards of fine black wool and burgundy contrast fabric on the long swinging skirt. It was so chic, so totally different from the usual glitzy ball gown. Alaia designed red ballet slippers to wear with it. Perfection. At parties in San Francisco and the Napa Valley and in Los Angeles and New York. 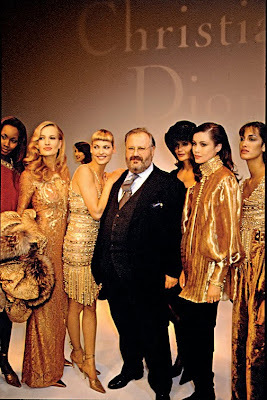 I’ve seen all the Chado Ralph Rucci tunics and jackets and coats and all the Ralph Rucci evening gowns. He's the best. His ensembles are the most luxurious, creative, and imaginative. These are couture pieces you wear in California and Paris and New York, and pieces everyone can enjoy. TS: Yes, this is not a museum collection. I wear them all the time. 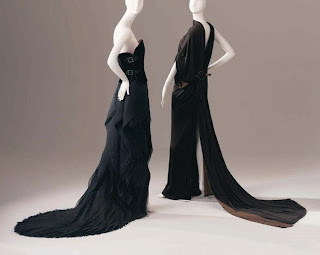 Ralph Rucci’s printed silk chiffon gowns and his silk faille and silk satin tunics and silk taffeta dresses are light and packable, and very practical. I travel with them. I am very fortunate. My collection of couture was not really conceived to be placed on mannequins and displayed in museums. I do not mind doing this once in a while, though.I wear all of my things all the time. Mine is a "living" collection that is evolving, and it uniquely reflects my style and remains timeless. I will keep adding as I find pieces. DDS: Tatiana, congratulations on this splendid event. It is your triumphant return to Moscow and I am so happy for you. God Speed. 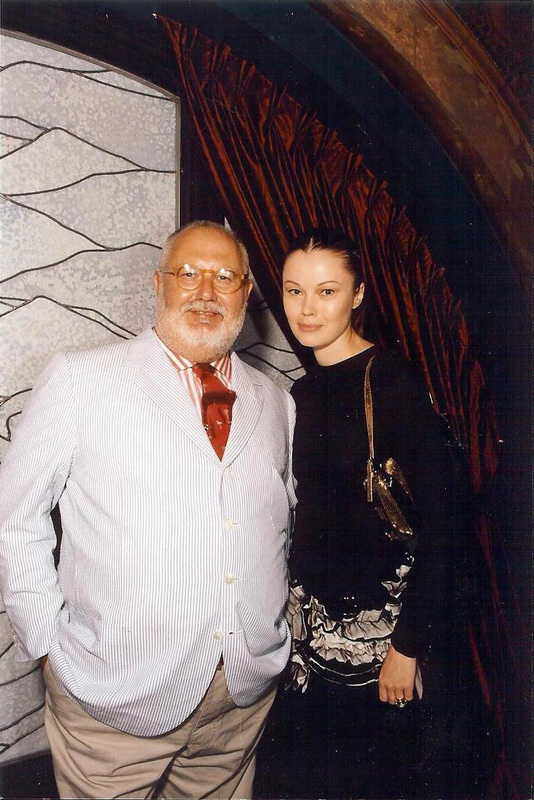 Tatiana Sorokko with designer, Ralph Rucci, at his apartment in New York. Tatiana wore Chado Ralph Rucci gowns above to the gala openings of the San Francisco Opera. 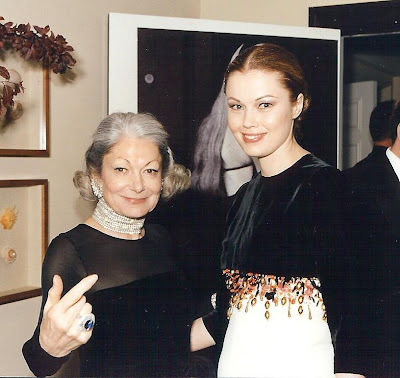 Tatiana in a vintage Balmain gown, with Denise Hale in GianFranco Ferre. 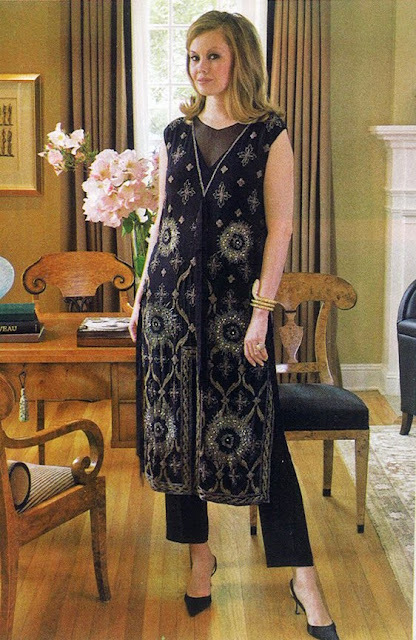 Tatiana in a GianFranco Ferre dress, in her couture closet, at home in Mill Valley, California. Tatiana strikes a pose with Jerry Hall at a Vivienne Westwood show. Photography of Tatiana Sorokko's couture fashions on mannequins by Ken Howie. Photography of Tatiana wearing Ralph Rucci gowns at the San Francisco Opera, and with James Galanos, by Drew Altizer. Photograph of Denise Hale and Tatiana Sorokko by Thomas John Gibbons. Portrait of Tatiana in black beaded dress at the residence of Ricky Serbin and Mitchell Benjamin by David Duncan Livingston. This is truly a collection of wearable art. Rather exciting to hear about the newly created RFM. 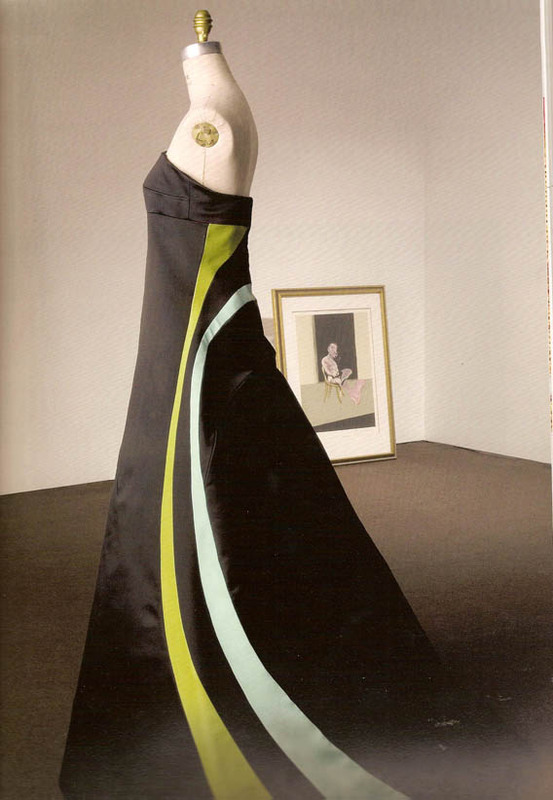 Years ago we received an auction catalog that I think was one of the first to show vintage couture at that level. The estimates were indeed low back then, and Tatiana was wise to invest. It does go to show that the collector with vision should look towards things made with artistry and craftsmanship, even if not widely esteemed at the present. We were in NY years ago attending an auction, and with time to spare saw an incredible exhibit of Dior at the Met. 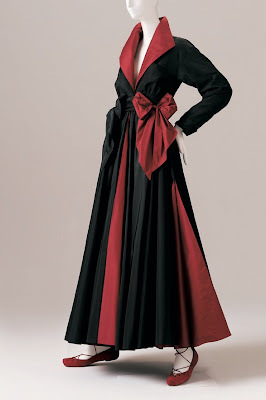 A voluminous red silk coat made for Eva Peron was fascinating as it alluded to Cardinal robes and was more than a garment, but an expression of power and even a kind of exaltation. 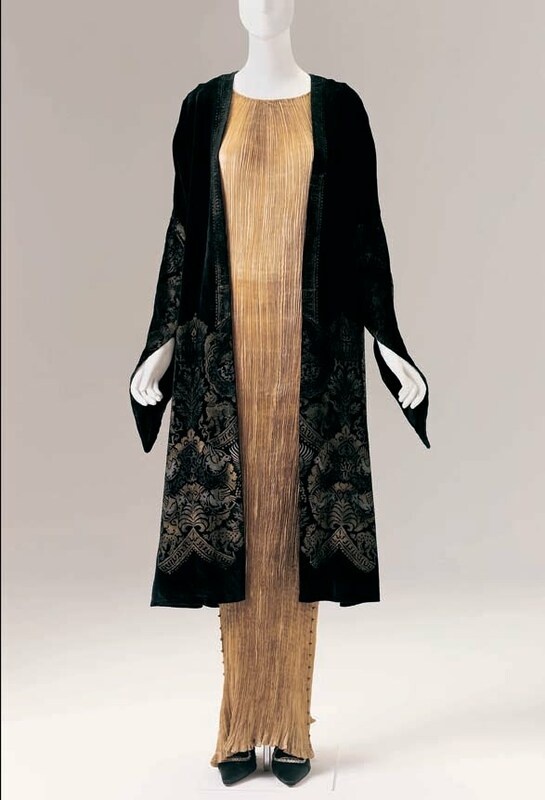 Ever since that exhibit I have come to realize that fashion at this level, like the decorative arts and architecture, reflect the ideas of an age. Your articles are always so thought provoking, Diane. Collecting couture like the artwork it is! Hi Philip and Hello Pamela and Edward! I am so pleased you enjoyed this feature. 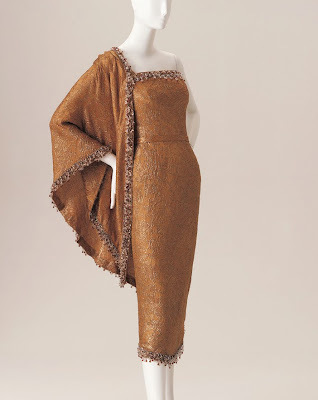 I've know Tatiana for ages--and have seen her couture collection grown and become more and more amazing...Galanos, new Rucci, new pieces of 20s Russian dresses, vintage Patou or old Lanvin. She left Russian just as the country was about to open up--but grew up under communism. Imagine going back now--with her trophies of vintage pieces. The dresses are so exquisite-I agree Pamela that they are fine works of art. They are all handsewn...the mark of couture...using techniques that are fast fading. I am happy to be have access to these images and her archival film from the last 20 years...few of these images ever published. Diane, absolutely fabulous images of these works of art! So unique, romantic, flowing. The fabrics are divine! It was so interesting working with Tatiana on this story--and especially as I was very familiar with many of the ensembles. For example, I had seen her at the opera gala in the Alaia gown. it was stunning--the skirt is made of dozens of yards of fine silk that moves so beautifully. I was at the opera covering it for WWD--and loved the gown so much that I worked for some time with my photographer to get a great shot of her walking so that we could see the movement of the skirt. I have often joked with her that I am one of the few people ever to see that gown--as we spent so much time shooting it. It was published in WWD. She has never worn it since. Ralph Rucci's gowns are incredible--she wears his designs most days--and I'm familiar with all of the pieces in her wardrobe, mostly black. His atelier is creating the most elegant and beautiful clothing and the most COUTURE in the US now. Thank you for your comments. Yes, they are works of art...functional ones. The fabrics, up close, are so exquisite. The beading on the sleeve of the Galanos tunic is so complex and highly detailed. I held my breath, so beautiful, this wonderful tribute to Tatiana and couture, a life very well lived. What a wonderful thing to wake up and read this morning. Will there be a catalog for purchase? Yes, Tatiana's longtime collection of couture is superb. I'm so pleased you enjoyed this story. The designs by Ralph Rucci and Alaia are particularly beautiful in motion--kinetic, floating, shimmering, and so lovely. Notice that she wears only simple shoes (usually black silk Blahniks) and she keeps jewels and accessories to a minimum. It's all about the dress. Dear Anonymous--if you send me a message through 'contact' on my website (www.dianedorranssaeks.com) I will send you a message regarding the hard cover book...which is superb. It is very collectible. WOW!!! what an AMAZING post!! you wrote: The designs by Ralph Rucci and Alaia are particularly beautiful in motion--kinetic, floating, shimmering, and so lovely. ~ So very true, I was thinking the same thing, but in my mind it wasn't nearly as well thought out. Again, enjoyed this post very much. What a truly wonderful read! 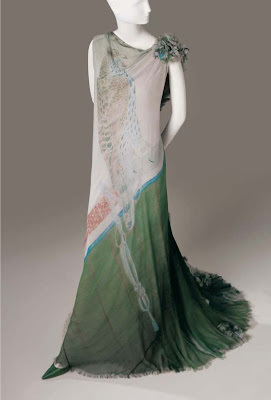 To see these beautiful artistic creations on a life form, brings movement that is so important in couture. It thrills me to know she wears these lovely gowns today and that is the finest tribute one can make to a designer. Welcome. So happy to meet you on THE STYLE SALONISTE and on Facebook. Hello, Tina- yes, Tatiana wears her couture often. Like other dear friends, she is not afraid to gently make some subtle alterations to make them more flattering and modern looking. I would not say she would change one of the historic beaded dresses--but for the Balenciaga dress, there was some subtle shaping done. These are museum quality pieces and they are well cared for, but they are also worn and enjoyed, sitting at a dinner, going to a ball, driving to an event. How fabulous. Nicole-Yes...some of the Ralph Rucci ensembles were made for specific events--her birthday party, a gallery opening, the opening of the Saint Laurent exhibit at the de Young Museum, a gala opera opening, a special party in New York. Others were found (and she noted) in a vintage show or in Paris. They are worn, enjoyed, admired. I did not make this point in the feature--but it is definitely a way to ensure that you will not look like anyone else, and you will not be wearing a duplicate gown. Maryanne-'shop girl' indeed! how very wonderful, especially in the golden days of Rodeo Drive. I hope you saved some Ferre for yourself. Frenchy--welcome! I hope the weather is warming up in Utah and that spring is on its way. Bravo to you for style and a vivid blog. What an extraordinary collection. Wonderful post.. thank you very very much! What an extensive, well researched and interesting post. Thank you! What stunning dresses! Maybe I'll have to go to Moscow! I would also love to start collecting vintage couture especially from Balenciaga. A remarkable career and a remarkable woman. To have had the wisdom to amass such an incredible collection of vintage gowns at the onset of your career. Tatiana's life would be such that most of us could only dream about; the inspiring, talented, iconic people she worked with is powerful. To have walked only a mile on her runway! Thank you Diane, fabulous post.